Missguided is always one of my favourite online stores for my holiday wardrobe and it's one of the first websites that look at when I'm trying to find amazing holiday inspired clothing! The variety of swimwear on their website is so amazing, so I knew that Missguided would be the place to order swimwear for our holiday to Mexico. We went on holiday to Mexico with our best friend Grace. It was one of the funniest holidays because we had so many hilarious moments! Grace is one of our oldest friends from home, we always have the best time with her! The weather on our first day in Mexico was so warm, and I wanted to wear one of my favourite bikini's! This Missguided Cross Front Mix & Match Bikini Set is the perfect holiday bikini as I think its such an essential to have a black bikini in your swimwear collection. A black bikini is timeless and something that I love to wear over and over again. I love the cross front detail of the top and I paired this with some Missguided High Waisted Bikini Bottoms, making the set super flattering. I also added this River Island Gold Body Chain that made me feel very 'Beyoncé' and wrapped a River Island Aztec Print Scarf that I wore as a sarong around my waist. 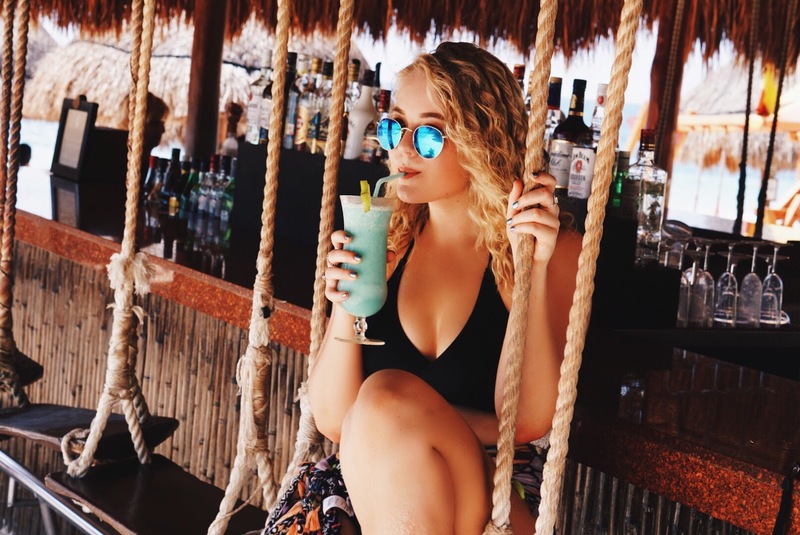 We stayed at the Dreams Rivera Cancun Resort & Spa and their beach bar had to be one of our favourite spots in the resort because of their amazing swing seats! I am also missing their delicious cocktails! Will you be rocking black swimwear this summer?